By Xah Lee. Date: 2011-03-15 . Last updated: 2014-07-24 . The W3C HTML Validator is getting annoying. 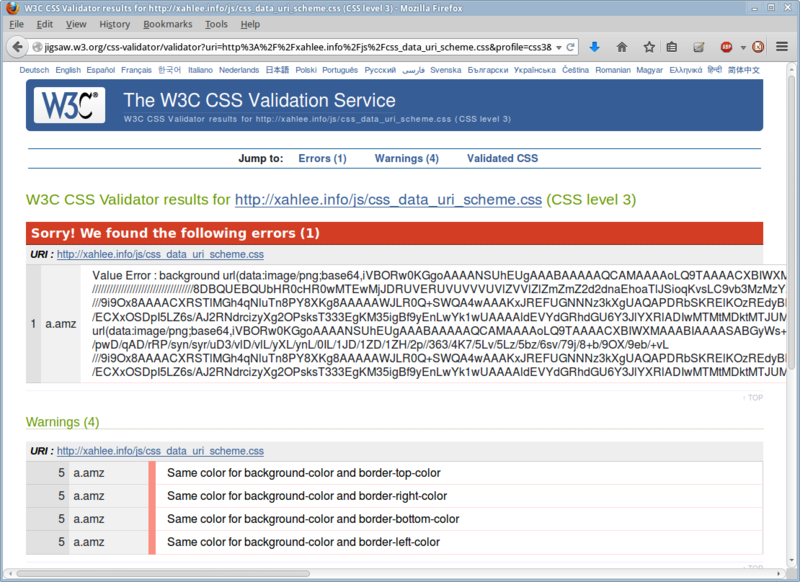 as of 2014-07-24 , the w3c CSS validator doesn't support CSS Data URI Scheme. If you have a page without a opening “body” tag, but does have a closing one, W3C HTML validation report it as valid. Maybe it's technically valid, but quite annoying. Test page: W3 HTML Validation Problem: No Open Body. If you use the XHTML style tag such as <br />, it's also reported as valid. W3C only gives a warning. However, this is technically invalid. Test page: W3 HTML Validation Problem: Slash End Tag. If you have “p” tag inside “li”, it's valid! Even in HTML 4 strict. Test page: W3C HTML Validation Problem: p in li. ID Value Can Start with a Unicode Symbol! However, you can start with a Unicode greek α and it passes W3C's validator. Here's a test page: Test: Unicode Character in HTML ID Attribute Value.